Reviews of books that have held my interest. And things that happen along the way. I have made it simpler to leave a comment. Just hit the comment selection and choose anonymous at the bottom- Or at my yahoo; robertrswwilliams@yahoo.com And let's not forget my friends at the Public Libraries!Most of my selections come from the Libraries listed on my sidebar. They are a great resource and a wonderful use of our tax dollars. Have you hugged a Librarian today? In a time when we have all become conscious of Islamic Fundamentalism it is a pleasure to read a book by a normal, run of the mill Islamic Man. How he has escaped the wrath that was shown to Salmaan Rushdie for his fictional writing is a conundrum. This book is non-fiction and describes the authors journey from a childhood in Pakistan to his current residence in the United States. Along the way he has been an Islamic student in Pakistan and in America. This gives him a unique perspective on the subject of Fundamentalism, whether Islamic or Christian. 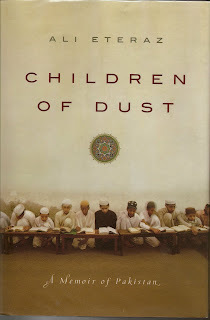 Enamored of Islam from an early age when he is taken to Mecca on a pilgrimage the story progresses to his youth in Pakistan and his wondering about the things that are forbidden to him- and why. When the family moves to America they begin a journey that takes them across the United States. This offers the author, as well as the reader, an unusually frank look at Islam and how it relates to America and her values of religous freedom and thought. By drawing comparisons to our differences Mr. Eteraz has shown us a mirror of our common values. The book is laid out in such a way that you needn't be a religous scholar to understand the rituals or practices that are the same in all 3 major religions. We share so much in our respective cultures yet the politics of discontent seem to have overtaken these similarities, pitting us all one against the other. Can this really be the Will of God? Interspersed along the way is a story of a young mans journey to find himself. And in his self discovery the reader finds a piece of himself.